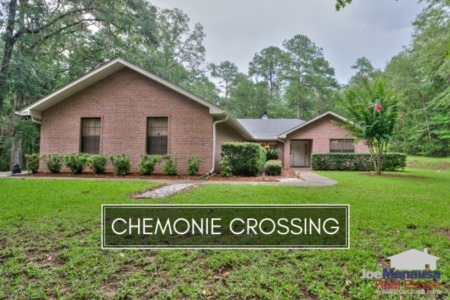 Located on the NE side of Tallahassee out Centerville Road just north of Proctor Road, Chemonie Crossing features larger homes on more than an acre of land. Chemonie Crossing has homes built from the early 1990s to present day, with the majority approaching the 20 year old range. This means that there are lots of opportunities for renovations and modernizations, and buyers are finding older homes on large mature lots to be a great project in lieu of building brand new today. 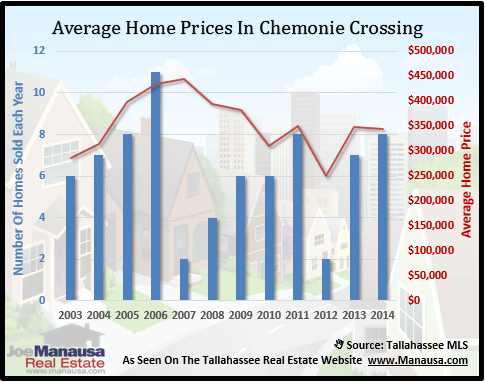 In this report, we will look at prices, values, and sizes of homes in Chemonie Crossing, as well as show current listings in the Tallahassee MLS and all closed home sales going back to 2002. For the three real estate graphs found in this report, you will find the number of closed home sales for each year (blue columns, measured on the left vertical axis), and an important real estate statistic shown in red (measured on the right vertical axis. It is important to note that sales are through December for all previous years, but through October in 2014. Average home prices have bounced around a good bit over the past five years, mostly due to the differences in the homes being sold. Distressed sales are are occurring at a slightly higher rate than what other neighborhoods in Tallahassee are seeing, which is also part of the reasons prices have not been very stable. 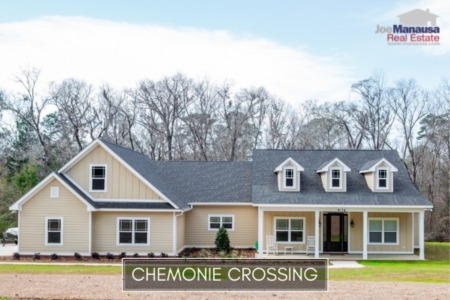 The average recorded sales price is $345,000 for Chemonie Crossing thus far in 2014. Home sales activity this year will be the best of the past 8 years, which is consistent with the levels recorded during the most active years from 2002 through 2006. Thus far in 2014, there have been 8 closed home sales in Chemonie Crossing. 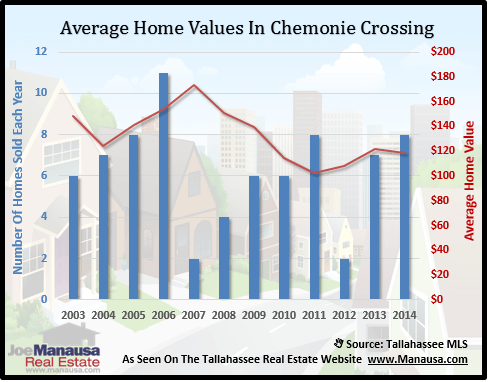 Average home values in Chemonie Crossing have dipped slightly since last year, after having enjoyed a nice appreciation trend since the low set back in 2011. Through October, the average value of a home sold in Chemonie Crossing has been $118 per square foot. This is up 15% over the bottom reached in 2011, but still down about 31% from the market high set back in 2007. This means that many homeowners who have purchased or refinanced in the past 8 years are likely at zero or negative equity situations. 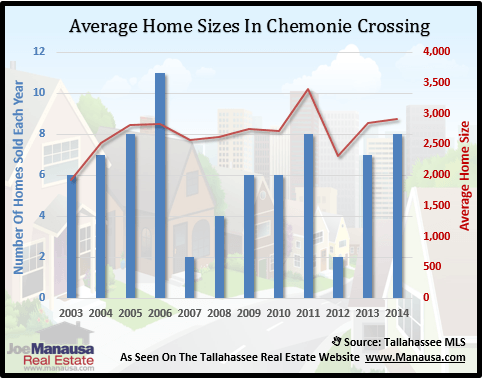 The average home size sold in Chemonie Crossing typically falls in a range of 2,500 to 3,500 square feet, and this year home size averages fall right in the middle. The 8 sales thus far in 2014 have averaged 2,915 square feet. The following list of homes are the most recent listings in Chemonie Crossing. The following list shows home sales going back to 2002 in Chemonie Crossing. I hope you enjoyed our November 2014 update on home sales in Chemonie Crossing, please feel free to drop me a note if you have questions not covered in this report.